Power Up Rentals LLC number one goal is taking care of our customers. Established in 2007 located in New Iberia LA, we began as a pump and hose rental company. Over the past 3 years, we have since branched off by expanding our equipment inventory, and a service division in located in Monahans, Texas. 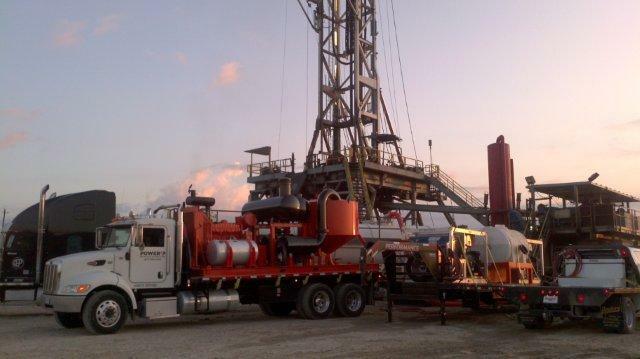 Our success is due to our OUR PEOPLE and RIG AND TANK CLEANING DIVISION. Our reputation as a cleaning cleaning service blows the competition away. Since 2010, We have been doing oil and water based tank cleaning for land based rigs. Using technology and innovation our MRW-5000 © can travel on site, complete a rig wash, and wash all equipment being loaded on trucks before leaving the location. All mobile units are are set up with 4) 5000 psi hot/cold pressure washers, and 2) 500 gallon water tanks to supply fresh water to washers. In addition to the MRW-5000 ©, we have the most powerful land-based vacuum unit called SV-6000 © . The SV-6000 © is equipped with a vacuum system operating at 450 hp at 6000 CFM at 27" of Mercury. In Compliance with ISNET WORLD, we are in the top percentile (A grade) based on ISNET WORLD's grading system. Our personnel are extensively trained with certifications in H2S, Confined Space, and many other safety procedures. In addition to our RIG AND TANK CLEANING DIVISION, we have a large inventory of rental pumps, shaker screen cleaners, hoses, and pressure washers to rent. No job too large or too small. We also have many fittings to adapt to any connection scenario we are faced with.